The new head coach says his side are making ‘small steps’ in the right direction. 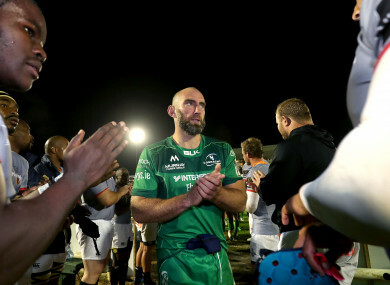 John Muldoon led Connacht to their first win of the season last night. CONNACHT COACH KIERAN Keane said he is pleased to have a first win in the bag but knows they will need to continue to improve after the 32-10 win over the Southern Kings. Keane’s men led 24-5 at the break and eventually pushed on to secure the bonus point 10 minutes from time against the Port Elizabeth newcomers. “We are making small steps, I don’t think we need to get ahead of ourselves,” said Keane afterwards. “We are making gains and we are moving forward so, that’s a real plus for me and I was really nervous before today. “There was better attack, a lot more polish around the handling and there were some better decisions. The workrate was good, the energy was good and the set-piece was good, particularly the scrum but those things can vary from week to week. Tries from Tom Farrell, Eoghan Masterson and Ultan Dillane helped Connacht lead 24-5 at the interval before Darragh Leader got over to secure the bonus point late in the game. Keane said that he knows there is room for improvement but also acknowledged that the Kings improved as the game went on. “They have got some athletes there and some real firepower so we were being drained as well by looking after all that. It was messy in parts but it wasn’t all our own making,” he added. Email “'I was really nervous before this game': Keane relieved to get first Connacht win ”. Feedback on “'I was really nervous before this game': Keane relieved to get first Connacht win ”.